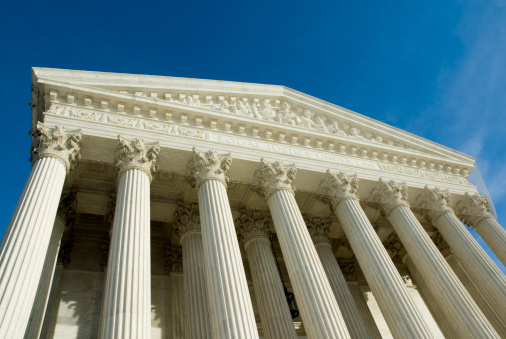 The case involved four Virginia plaintiffs who challenged the IRS ruling that individuals are eligible for the premium subsidy regardless of whether their state has a state-run or federally-run Marketplace or Exchange. The plaintiffs did not wish to purchase health insurance, and would have been required to with the availability of premium tax credits. They contended that Section 36B, by its plain language, only allowed premium subsidies for insurance purchased on Exchanges created by “states.” Since Virginia has a federally-run Exchange, plaintiffs claimed that they were not eligible for premium subsidies, rendering insurance unaffordable to them and exempting them from the ACA’s requirement to purchase coverage. The Kaiser Family Foundation reports that currently there are 14 states with state-based Marketplaces, three with federally supported Marketplaces, seven with state-partnership Marketplaces, and 27 with a Federally Facilitated Marketplace (FFM). Chief Justice Roberts, writing for the majority, boiled the case down to the question of “whether the Act’s tax credits are available in States that have a Federal Exchange.” The opinion begins by describing the ACA’s (or “the Act” as it is referred to in the opinion) three key reforms: (1) guaranteed coverage and community rating; (2) the individual mandate or the requirement for all Americans to maintain health insurance; and (3) making insurance affordable by giving refundable tax credits to individuals with household incomes between 100 percent and 400 percent of the federal poverty level (FPL). “These three reforms are closely intertwined,” and Congress was clear that the first reform’s success (guaranteed coverage and community rating) was upheld by the coverage requirement, which in turn would only be successful with the tax credits. This is because without tax credits, the cost of buying insurance would exceed 8 percent of income for a large number of Americans, exempting them from the coverage requirement. The Court ruled that the intertwined importance of the three was underscored by their uniform effective date of January 1, 2014. Holding that Congress knew how to equate two different types of Exchanges when it wanted to do so, and accusing the majority of engaging in “interpretive jiggery-pokery” Justice Scalia writes that although it might not make sense to only allow tax credits to those on state Exchanges, the result would be odd, not ambiguous. Recognizing that mismatches often occur when lawmakers draft a single provision to cover diverse or different types of situations, Justice Scalia further disagreed that the structure of Section 36B provides support for tax credits for those on the federal Exchange, noting that many individuals are eligible for various tax credits at the outset only to later be provided a credit amount of zero due to income thresholds. Justice Scalia cited the child tax credit, the earned-income tax credit, and the first-time homebuyer tax credit as examples. Justice Scalia argues that the Court is wrong in both its decision to consult statutory purpose and its analysis of it. Finding that the ambiguous language at issue was used in other parts of the law, Justice Scalia argues that this was not “a slip of the pen,” but purposeful by Congress. Justice Scalia argued that if Congress valued the ACA’s applicability to all, it had the power to make tax credits available on all Exchanges. For more information about the Exchanges, request UBA’s PPACA Advisor, “Frequently Asked Questions about the Health Marketplace”. To get the latest information on employer reimbursement of premiums for individual coverage and incentivizing employees in poor health to enroll in the marketplace, view UBA’s PPACA Advisor, “Agencies Disallow Several Plan Designs; Other Federal Developments”.